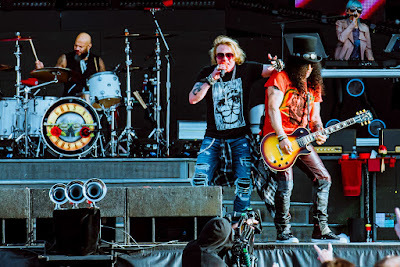 Guns N’ Roses headlined the second of three nights at the Download Festival at Donington Park in Leicestershire, UK on June 9, and video from the event is streaming online. Opening with a pair of tracks from their 1987 debut, “Appetite For Destruction” – “It’s So Easy” and “Mr. Brownstone” – the band delivered a 3-hour, 28-song set of classic tracks and covers and featured the third 2018 performance of the 2004 Velvet Revolver classic, “Slither”, following its recent debut in Berlin, Germany on June 3. The tune was the lead single from “Contraband”, the debut album by Velvet Revolver – which featured GNR members Slash, Duff McKagan and Matt Sorum, and entered the US Billboard 200 at No. 1 on its way to sales of more than 2 million copies in the country. Guns N’ Roses closed out their Download appearance with an encore of their 1989 hit, “Patience”, a cover of The Who’s 1970 track, “The Seeker”, and the finale of “Paradise City” – which was streamed live by the group via social media.